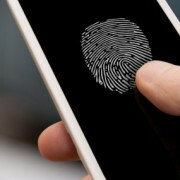 New research from Deloitte has pointed the finger at biometrics for one of the big trends of 2018 as we start to forget our passwords, reports Telecoms.com (Banking Technology‘s sister publication). The firm estimates that 15 million UK consumers now have a smartphone that incorporates a fingerprint scanner, roughly 36% of the user base, with 79% of this group actually using it. Should the numbers prove to be accurate, the convenience and speed has seemingly overridden the fear of the new, which is usually a notable barrier for most technology to overcome. The most common biometric application, at 96%, was to unlock the phone. “Most smartphone owners use biometric authentication because it is faster and more secure than traditional methods,” says Paul Lee, head of research for technology, media and telecoms at Deloitte. Passwords have to be ever longer and more complex in order to be secure, which makes them hard to remember. However, while the fingerprint has been accepted as a means to unlock features alterative biometric technologies, such as voice, facial and iris recognition, are less used. The research showed only 3% of the UK population are making use of these features. This might seem like a surprisingly low statistic, but perhaps this is one which is going to surge over the short-term. After all, the idea of biometrics has seemingly been normalised by the fingerprint scanner. To correct this is perhaps nothing more than an education exercise from the handset manufacturers, as facial recognition is more secure than fingerprint scanners. Or maybe it is simply down to the features available on the smartphones themselves. As more phones get launched across 2018, fingerprint scanners and facial recognition software will become a standard feature, therefore by just being available they will be used more. For the moment this is a very basic use of the technology, mostly limited to accessing devices. There are a few companies out there who are trying to integrate biometrics into everyday activities, Vodafone is using voice recognition software as a means to identify and authenticate customers when they contact call centres, but this is still very much early days. Deloitte says it’s confident the technology will spread to areas such as finance before too long, but that is another hurdle which will have to be crossed. When it comes to money, people are generally very sceptical about new ideas, especially ones which haven’t been vigorously tested in other applications. Biometrics will play a strong role in finance in the near future, but there will have to be a bit more work done to convince the consumer before mass market penetration. As part of its expansion into IT services, Chinese telecoms giant Huawei has partnered with 11 banking IT solution providers to establish an open platform ecosystem for the finance industry.